Sitting sipping coffee at Berghotel Schwarenbach, located 2,061 meters above sea level in the Swiss Alps, you look out onto snow-covered mountains as the sun peeks over the ridge. It’s 11 a.m. and the sun is just shining down on your outside table, warming you as you sip your hot coffee. The mountains are rugged, covered in snow except where the rock ridges jut out into the sunlight. Berghotel Schwarenbach, a stone inn and restaurant built in 1742, is tucked away in the valley, and just a one-and-a-half hour walk from the Gemmi Pass. The Pass is reached only by cable car from Leukerbad. Scenery along the Wanderweg (walking trail) is no less spectacular than the view from the café. To start your walk, take a train and then a bus from anywhere in Switzerland to the southern alpine village of Leukerbad. Berghotel Schwarenbach is about half way between Leukerbad and Kandersteg. Take the bus to the Gemmibahnen cable car station. The cable car will whisk you up to the Gemmi Pass, with a great vertical mountain face rising in front of you, while Leukerbad, about 3,000 feet below, shrinks away into the valley, getting smaller and smaller. Once you disembark from the cable car, look for the “wanderweg” trail, not the sledding run, and start your downhill walk toward Berghotel Schwarenbach. Even on the wanderweg you may be passed by families sledding down this trail to go to Lake Daubensee or Berghotel Schwarenbach. Just about 100 yards from the cable car you have the view of Lake Daubensee nestled in the mountains, covered with snow. Daubensee has a wanderweg path around it, and cross-country ski trails crisscross the lake. Walking around the lake is a breeze — it’s flat. From Lake Daubensee, the trail goes downhill to Schwarenbach. You’ll see the hotel before you get there, as the stone building stands out from a long way off, contrasting with the snow. 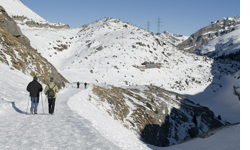 This high Alpine winter walking path is open from Christmas to Easter. It is only accessible during good weather and snow conditions, and may be closed for short periods. After your relaxing lunch continue your walk to Sunnbuel and then take the cable car down to Kandersteg. As you descend, you will cross the ski slopes of the Sunnbuel ski area. Look out for skiers coming down the hill. The Sunnbuel cable car will take you down to Kandersteg, about 2,500 feet below. As you ride down in the cable car, Kandersteg comes into view and grows larger and larger as you enter the shadow of the mountains. From the cable car station at the bottom, you can take the bus to the train station in Kandersteg and then the train back to your final destination. Leukerbad is known for its natural thermal baths. The village offers a choice of 30 thermal pools and a wide variety of hotels and spas offering wellness packages. 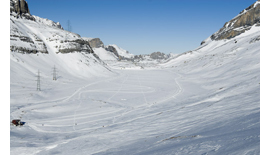 Kandersteg is known for its sports, hiking, downhill skiing and snowboarding, ice-climbing and cross-country skiing. Places to stay range from 5-star hotels to very reasonably-priced pensions. Is “Off Season” Vacationing for You?